The summer holidays are almost over and it’s hard to believe we are almost back to school. Here in Kay Christine we have been very busy going from one crisis to the next, but thankfully we are all well and getting ready for a new school year. Back in May we had Marcus* sick again and for most of June he was not well. With good antibiotics he once again made a super recovery and he is doing great! Last night he was singing in his bed right up to 10 o clock! As Marcus was recovering, Binjanie* became sick and we were all worried about her. 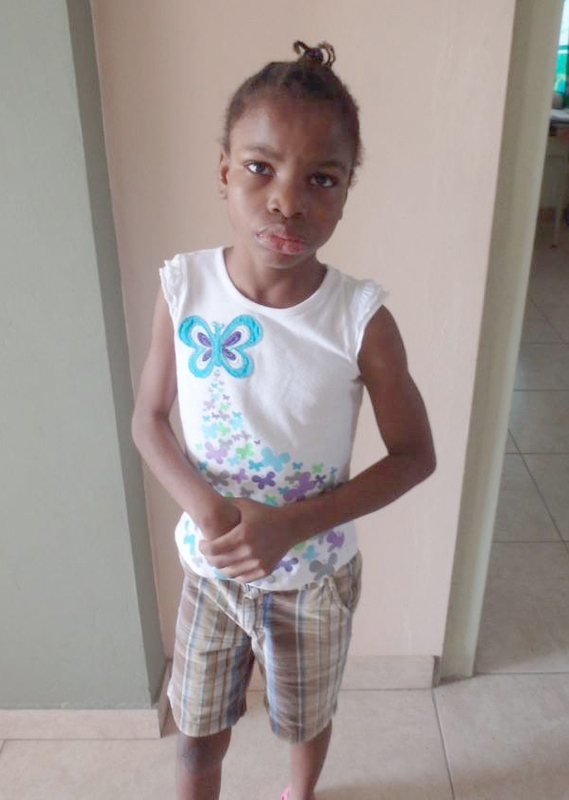 Binjanie needed an operation to relieve the pressure in her brain due to the excess fluid. We wondered when and where we could do this. Imagine how lucky we were that within two weeks there was a top class neurosurgeon coming to do exactly these operations (in a hospital very close to us)! We were put on a list for this doctor to see and when he saw Binjanie he said he would operate the next day! So our little princess had her operation and has been doing great ever since. She is such a happy little girl and always singing and laughing. She keeps everyone entertained and her happy disposition ensures she is always surrounded by people. Solina and Xiomala have been with their sister Jertha for the holidays. Jertha works with us in our rehab center (Kay Ste. Germaine) and both girls have been coming to work there each day. As they are both already in their mid twenties we want to continue this arrangement. When they are at Kay Christine, they tend to behave like kids and are always in fights with the others. They don’t seem to grow and develop anymore – which is to be understood as they have spent all their lives at the St. Helene home. During the summer we have seen big changes in them. They come to work each day and work very well and they behave very well. They are happy and they enjoy living with Jertha. So we will now keep this arrangement and will help Jertha build a small house so they can all live more comfortably together. Each month we will give Solina and Xiomala a salary and in this way they will be able to contribute to their living expenses and they will have more “normal” lives. From time to time they will come to Kay Christine for a “weekend” and they will thus keep contact with us. It’s a big change for them but they seem to be doing fine. Here in Kay Christine things are a lot quieter as we do not have the constant battles and the younger ones – assume more responsibilities. So it is working well for all! Jenny has been wanting to go back to her family for over a year now. In fact she has created all kinds of problems in order that we would send her back. We started to have her go home every weekend – she has a Mom and siblings. She was spending the week longing for the weekend. She was not interested in school or anything. She just wanted to go back home. We had several talks with her Mom and our social workers. We felt that it was best for Jenny to go back home because she was not learning anything with us and she had a very close relationship with her Mom. She had initially come to us at a time when the family was having a hard time and were unable to manage her. As she got older and she saw other older kids going back to their families, she also decided that it was time she moved on. Once we saw that she was no longer benefiting from being with us, it made more sense to have her live at home and to help her there. So after many, many discussions and much to Jenny’s delight, she went back home. She goes horse riding with our kids every Wednesday and we keep in close contact with the mother and Jenny. We will be organizing a visit to her very soon and for sure she will love that. She will also come to visit from time to time. So you see another big change! Since Jenny left, we have a free bed and as you know there is always a list of kids waiting to come to us. In the NPH Haiti St. Damien hospital, there is a room for abandoned children and most are severely handicapped. So I took a visit and there I met Veronica,* who will be nine in September and was abandoned in our hospital in March of 2013. She had been admitted suffering from severe malutrition, epilepsy and she was in a coma. After a few weeks of good medical care, she recovered but no one ever came back for her so she stayed in that room. My first impression was that she was a smart girl that had suffered a lot and was not trusting of many. She seemed to understand everything but seemed to be indifferent. I noticed that she listened very well and that she observed very well. I asked her if she wanted to come and live with me and the other kids- with Jerry* and Binjanie (I knew she knew them because last year she was there in the hospital when I brought them to Kay Christine). At no time did she give any sign that she wanted to come with me, but I felt that she was very aware what I was saying her! So anyway I kept going for little visits weekly so she would know who I was and I kept telling her she would be coming to live with us. The social workers were preparing the legal papers and in Kay Christine everyone was waiting excitedly for the new arrival. Arrival day finally arrived and flowers and toys were placed on the bed awaiting Veronica. It was August 14th! The picture below was taken that day! Now Kay Christine kids are ALWAYS happy to welcome a new visitor to the house. So you can imagine how excited they were to welcome a new sister! Sadly for the house and the staff our dear Veronica was not one bit interested in the welcome. She ignored everyone and just followed me about the place. In fact, for the first few days, she never let me out of her sight BUT it was obvious she was settling in and she was so much enjoying the space and being able to run around. Limits were difficult for her and when you said “no” she had a big, big temper tantrum and we got to hear her language very well!! In fact while she refused to talk to anyone, if she was angry she spoke very clearly! Anyway we are very happy with our little girl! We are all determined to give her a great life! Please do keep her and us in your prayers! I think that about covers all my news for now! We have to get the uniforms ready now for school and sure once school starts it feels like the year is over! For sure a lot will happen between now and the year end. I thank all of you for all your continued love and support! Please continue to support us so we can continue to give these kids a great home.